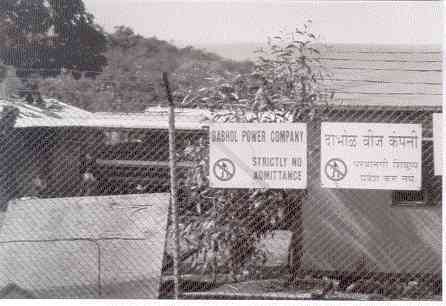 Beginning in 1994, when construction of the Dabhol Power project began in Ratnagiri, local farmers, shop-keepers, fisherpeople, politicians, and other residents of the district staged protests against it. Protests ceased in 1995 through the end of 1996, because construction at the site was suspended due to the cancellation of the project by the Shiv Sena-BJP government and during consideration of the CITU case. The abuses took place in the context of a state of emergency that had been imposed for DPCs benefit, and those responsible were state agents acting at the companys request with additional surveillance provided by DPC. This report focuses on a series of thirty demonstrations that took placeat the height of opposition to the Dabhol Power projectbetween January 13 and June 1997 in Guhagar and Chiplun, population centers in Ratnagiri district. 112 Human Rights Watch interview with Dr. S.B. Bhale, Guhagar village, February 15, 1998. 113 Human Rights Watch interview with Ataman More, Veldur village, February 14, 1998. 114 Indian Peoples Tribunal for Human Rights, Submission on Enron in India, April 17, 1998, p. 4.